Our product range includes a wide range of edta chelated micronutrients and edta chelated mirconutrients. Now a days with a massive increase in micro irrigation technique i.e. drip irrigation system in agriculture application of various chelated micronutrients is increasing dayby day. For best results these are made available in the form of EDTA Chelates. We at Agrisearch (India) Pvt. Ltd. are manufacturing various micronutrients in the form of EDTA chelates at our stateoftheart manufacturing facility. These chelated fertilizers are very easy to use along with drip irrigation and are suitable for foliar spray for quick results. These are all in chelated form and hence requiredin low quantity . No harmful effects and can be used with phosphatic fertilizers also. These are water soluble micro granules where contents stay in a chelated or EDTA Form and all these are for prevention and correction of respective deficiency. 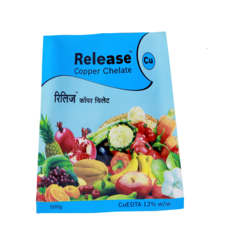 Compatibility :- All Release EDTA Chelates are compatible with all kinds of fertilizers. These are compatible even with phosphatic fertilizers. Various chelates at a glance under our Release EDTA Series with their doses and packing. Soil Application / Fertigation:-500gm to 1 Kg perAcre. Foliar Spray 0.5gm to 1gm per Liter of water. Packing :-100gm, 500gm, 1Kg, 5Kg Bucket. Foliar Spray :-25gm to 50gms for 200 Liter of water. Soil Application/ Fertigation :-500gm to 1 Kg perAcre. Foliar Spray :- 0.5gm to 1gm per Liter of water. Now a days with a massive increase in micro irrigation technique i.e.drip irrigation system in agriculture application of various chelated micronutrients is increasing day by day. For best results these are made available in the form of EDTA Chelates. 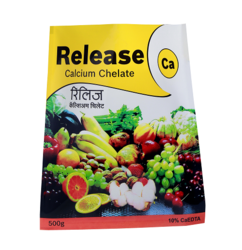 Benefits:-These chelated fertilizers are very easy to use along with drip irrigation and are suitable for foliar spray for quick results.These are all in chelated form and hence required in low quantity . No harmful effects and can be used with phosphatic fertilizers also.These are water soluble micro granules where contents stay in a chelated or EDTA Form and all these are for prevention and correction of respective deficiency. fertilizers.Various chelates at a glance under our Release EDTA Series with their doses and packing. Dose :-Soil Application / Fertigation :- 500 gm to 1 Kg per Acre. Foliar Spray:- 0.5 gm to 1 gm per Liter of water. Packing :- 100 gm, 500gm, 1 Kg, 5 Kg Bucket. Foliar Spray :- 25 gm to 50 gms for 200 Liter of water. Soil Application / Fertigation :- 500 gm to 1 Kg per Acre. Foliar Spray :- 0.5 gm to 1 gm per Liter of water. Soil Application/Fertigation:- 500gm to 1 Kg peracre. Soil Application / Fertigation :-500gm to 1 Kg peracre. Foliar Spray :-	0.5gm to 1gm per Liter of water. Looking for EDTA CHELATES ?